In this article, I would be going over a few tips and tricks you should have up your sleeve when choosing the best backpacking tent for your next hike, and a few options you can consider depending on your budget, weight-carrying capacity, the room you require from your tent and the quality and durability of the tent itself. Apart from sleeping in, they are effective in protecting you against bad weather, wild animals and insects, and even for cooking small meals and reading under starry skies. What to consider when buying a new tent? Everyone loves to get out from the hustle and bustle of the cities, to open spaces, sandy beaches and windy mountains. But travelling is at its absolute best when you get off the usual trails, make your own way and go where no one has gone before. This is where an awesome tent comes into picture. A backpacking tent is exactly what it sounds like. It means not just a regular tent, but a collapsible shelter, that can fit in your travel pack and be carried around easily. A simple backpacking tent is nothing more than a clever construction of canvas stretched over metal poles and fastened to the ground using ropes and screws, like the Eleoption lightweight tarp shelter. If you have a sturdy backpacking tent, you can literally set up camp wherever you like. No more looking for expensive hotels and planning only day-trips. With a tent, you can explore freely and enjoy a full night’s sleep after a long tiring hike. What’s more, you get the opportunity of waking up to gorgeous views first thing in the morning. An all-round backpacking tent will make all this – and more – possible. Now, I sincerely hope the dreams of creating new trails and being the first person to catch that golden light at the peak have convinced you into buying the best tent for yourself. Let us take a look at the factors to keep in mind when choosing a new tent. There are many things that go into a tent, and because there are thousands of models available, choosing one tent is tough. Moreover, everyone’s priorities are different. At the end of the day, you yourself have to decide which factor to give the most importance to. Nevertheless, to make things a bit simpler, here are a few criteria to help you in choosing the best backpacking tent. This one is fairly obvious. The heavier your tent, the more tiring your journey. Trust me, every ounce you save will double your comfort during the trip. I remember taking my Dad’s 4 kg tent on one of my earliest hikes, and ending up hating everything about the trip. It was only later I realized that I was annoyed because of the weight of my pack, which made my back hurt like hell. A general rule of thumb is that a tent designed for sheltering 1 person should be around 1 kilogram, while a 2-person tent should be around 1.5 kg. The weight of the fabric used in a tent is expressed in ‘denier’ (D). The lighter tents will use fabrics of about 10D, while the all-weather expedition bags go into 500-1000 D.
The new standard for best backpacking tents is ‘ultralight.’ Generally, backpacking tents have their own dedicated poles, but this new category of ultralight tents use trekking poles or other light materials for being set up. If your hiking style involves more walking and spending less time in the tent, an ultralight tent will best suit your needs. With improved design and reasonable costs, many campers and hikers are now opting for an ultralight tent like the Big Agnes HV UL2 – which saves weight while providing protection. Even this criteria is a matter of compromise when buying the best tent for yourself. Do you go for a bigger and heavier tent with space for your family – like the Coleman 6-person tent – or a smaller tent for solo trips that is comfortable to carry around ? The two measurements you have to take into account are length (for being able to easily straighten your legs) and height (so that you can at least partially sit up inside). Usually, the height of whatever backpacking tent you choose should be at least around 35 inches, while the length – for an average adult – should be at least 70 inches or more. These specifications will give you quite some space to wait out a storm, while also not being claustrophobic. Backpacking tents use different materials, all of which affect durability, weight and price. Here, I will talk about the 3 most commonly used fabrics. Even before you begin reading this part, I would advise you that you consider only the last 2 fabrics for your tents, especially if your travels get a little rough. The first category of fabrics should be your last resort, but it will work well for backyard camping and other pleasant family trips. Polyurethane coated fabrics are the best budget choice for inexpensive backpacking tents. Often used to make any fabric waterproof and provide it with some amount of durability in harsh weather, PU coated fabrics are cheap and very light. The drawback to this jack-of-all-trades fabric is that in tropics-like conditions, this fabric is susceptible to chemical tear (hydrolysis). The fabric starts to get sticky and tangled – think a spider’s web – and might even start to flake off. If you absolutely need to save money and don’t need the best highly weather-resistant tent, you can look at PU coated fabrics. Although, I would advise that you at least look for fabrics with PU coating of polyether, rather than urethane. This coating will be more resistant to hydrolysis. Silicone coated nylon is a more serious choice. Used on almost all the best and more expensive tents, this fabric is very durable and highly waterproof. It also has the added benefit of being slippery, which means it will be better for wintery conditions. The snow will slide very easily off of SilNylon tents. The drawback of SilNylon is that it is more expensive than PU coated backpacking tents. Also, because it is difficult to make things stick to SilNylon fabric, manufacturers use nylon that has silicone on the outside – which cannot be factory taped – and PU on the inside – which can be taped. This PU-SilNylon combination is found mainly on the best and highest quality backpacking tents. Another thing, SilNylon is flexible and sags according to weather, which means your guylines will have to be adjusted more often. However, I have never found the need to readjust to be very frequent or that annoying. Double-sided silicone coated fabrics are even better. They will provide more strength and weather-resistance to your backpacking tent, although they cannot be repaired using duct tape – a feature I believe every fabric should have. You will have to go for stitching or silicone bonding. But this is just nitpicking. You probably won’t even tear your SilNylon backpacking tent. So no need to worry about duct tape! Dyneema, or Cuben fiber, is the futuristic fabric manufactured by DSM, which might find a place in Batman’s suit. It is amazingly light, highly durable and the most waterproof fabric yet. No wonder I believe it to be the best backpacking tent fabric made. The dyneema threads are sewn together with UV-resistant mylar threads, which makes it even stronger than Kevlar. Dyneema was even used for a 30 km long tether in a Russian satellite! Apart from being lightweight and durable, Dyneema does not stretch, which means no frequent readjusting of your backpacking tent’s guylines. Also, it can be easily fixed using duct tape, although the likelihood of you needing to repair a dyneema backpacking tent are too low to be significant. As might be obvious, the gains you get are enormous, and so is the price tag. Tents made with Cuben fiber are four to five times more expensive than SilNylon ones. Also, because it does not stretch, you cannot always force it tight if pitching conditions are bad, unlike the flexible PU fabrics. Moreover, it is more prone to a puncture (not to tearing). Another thing you should keep in mind, dyneema is less slippery, so it may not be ideal for cleaning up the deposited snow. Dyneema might be expensive, but I believe that if your camping is of the extreme kind, the payoff will be great. The probability of puncture and snow deposit and not being able to fix it sub-optimal conditions are not of much consequence. Ultimately, it will be a question of saving weight with dyneema or saving money with SilNylon for your next backpacking tent. Freestanding backpacking tents are exactly what they sound like. These tents have their own framework of poles and rods to stand upright. Although you may attach stakes and guylines for additional stability, you do not always need them. The benefit of freestanding backpacking tents are first and foremost their ease of setup. Let the surface be soft soil or hard rocks, where stakes do not hold, these tents will get erected without extra support. Also, because freestanding tents have their own metal poles, they are stable even against harsh weather, where low-quality stakes might get disturbed. Even better, the lack of guylines and stakes and ropes means that you can set your backpacking tent up quickly and easily, without having to carry their extra weight. Non-freestanding backpacking tents are also great, especially for beginners. As might be obvious, they require external support through guylines and stakes. You can also use your trekking poles instead of having poles specifically made for the tent. The major advantage of such backpacking tents is their weight. Due to absence of their own metal frames, they are very compact and portable. Also, they are quite cheap, as it is basically only the backpacking tent fabric you are paying for. Before I begin talking about this backpacking tent, let me tell you that it is quite expensive. But I will also tell you that it is worth it. There are cheaper options in the market, but I personally believe that this is hands-down one of the best you can get. The price is justified because of the lifetime warranty you get with an MSR backpacking tent! The MSR Hubba Hubba NX is a great 2-person tent, and very compact and portable. It is easy to setup too, and because it has 2 doors, you can go in and out of the tent without having to crawl over your travel mate and disturb their sleep. It is a freestanding design, but not fully. The backpacking tent requires a couple of poles on one end to stand up properly. Once you do set it up, it is amazingly roomy. I tried this tent out on one of my hikes, and weighing at about 3.5 pounds, it started to feel heavy after a while, although the comfort at night made the weight worthwhile. If you are going to be sharing the tent and its weight with your partner during your travels, you won’t even notice the weight. The backpacking tent comes with a segmented pole that unfolds to form the external frame of the tent. The tips of the tent pole easily slip into holes designed in the guyline itself, which form a curved arch. You can attach the inner tent to the frames using plastic clips that come attached with the tent. What’s even better – if you need to read the instructions for setting up the backpacking tent, no need to worry. The instruction booklet comes attached to the sack the tent comes in, so you can’t lose that! The outer fly covers the whole tent, and comes with color-coded corners so that you match the right corner in the right orientation. The corners of the fly too have clips which fit over the pole ends. You can even set-up the fly first using the clip system, and pitch the tent later inside it. The Hubba Hubba NX is not fully freestanding because you will require at least 2 stakes for the vestibules. Also, the vestibules have zippers along the sides, rather than the middle, which makes it even easier to move in and out of the tent. For one person, this backpacking tent is a palace. Although, if it is 2 people inside the tent, it might get a tiny bit stuffy, especially if you are using sleeping bags of around 30 inches width. This tight fit becomes an inconvenience only if both you and your partner are using very wide bags, which I think will be rare. The MSR Hubba Hubba has a height of almost 40 inches, which makes it spacious enough to sit up in. The length is around 84 inches, although after pitching it tight, the usable length might be only 82 inches. The width is almost 50 inches, which is why wide sleeping bags might bulge out the sides of the tent. But all in all, I don’t think this backpacking tent will come in the way of your comfort. The interior length of the tent is enough to let you sleep comfortably, while also leaving some space at the ends for your gear and a comfy pillow. There is also an interior mesh pocket along the width of the tent for storage. The vestibules at the sides of the Hubba Hubba NX are quite large, and even your bigger capacity bags will fit inside without blocking the doors. Keeping the vestibule doors and the window vents open provides plenty of ventilation and light. Also, because of the external framework style of the tent, the rain fly is kept separate from the inner side of the backpacking tent, which means less dampness and minimal moisture in rainy weather. More on the heavy side if weight of the tent is not shared. This backpacking tent is for people who are on a strict budget and don’t mind a heavy tent for short journeys, like summer camping trips or just backyard camping. The Rei Passage 2 might seem like a compromise, but its shortcomings are not something unbearable for such a low price. Overall, it will do well, but you should not expect the tent to last in very rough weather continuously, as it is uses PU material which is liable for degradation. Moreover, the non-branded poles that come with the backpacking tent are quite frail and won’t withstand heavy rains, and unless you buy some guylines (none comes with the tent), you might get some splash-back from the sides. Let me save you some time and tell you that the Rei Co-op Passage 2 is your tent if you are camp infrequently and are simply looking for a roomy and inexpensive option. Setting up the tent is a very simple task. All you have to do is get the X-shaped cross frames up and stake out the side doors. Almost all tents have at least one other step to be taken to get the tent right. The advantage of such a simple X-design is that the backpacking tent becomes very easy to shift. The freestanding design can be easily picked up and moved around if you don’t find the place where you have setup to be comfortable. Once packed up, the backpacking tent gets quite heavy for a long solo journey. Weighing in at about 5 pounds, you will find it difficult to carry. The Rei Passage 2 has some sort of a nylon mesh paneling which helps in keeping condensation to a minimum but contributes to the weight. Ultimately, it will be a trade-off between the weight you want to carry and the money you want to save. Even though it might be heavy and not very durable, the Rei Co-op Passage 2 should be more than simply comfortable for 2 people. The floor dimensions are 88 x 52 in, which should be sufficient for you and your partner, assuming that there is not a lot of luggage to store. The peak height of the tent is 40 in, which means a person of average height should easily be able to sit up inside the tent. The Passage 2 has plenty of space in its vestibules too, with the total area being 18 sq feet., which should easily hide all your packs and boots from the rain. The fly has vents which “pop”out for extra ventilation. The one thing which bothered me in this backpacking tent were its pockets and the rather large zippers of the vestibule. The pockets are triangle-shaped, with only one corner attached to the corner of the tent, which meant that the pocket could not handle the weight of the stuff I put in and everything kept sliding out. The big zippers make using the door silently a bit difficult, and there is a chance of you disturbing your partner. One tip I would give for users of this tent is that you should always camp at places sheltered from high winds, as the poles do not seem like they would be able to handle much force. Also, be careful of getting the PU fabric inside wet, because they might tear with rough use and start feeling sticky when sleeping. It might seem like I am not in favour of this tent much, but do not get me wrong. The Rei Passage 2 is suitable if you know what you will be getting. It is the best backpacking tent for people on a tight budget, who don’t mind the extra weight and go for trips that do not require the toughest of the tough. The Nemo Hornet backpacking tent is an exciting choice because of its ultra light 2 pound weight, 2 doors and vestibules, with a freestanding design. Actually, I should mention that the Hornet is more of a semi-freestanding design, because you will have to stake out one end to maximize the interior space for 2 people. Although there has been a little bit of compromise on the interior space in the 2-person model, the Nemo Hornet is amazingly good for long solo trips. It might get a little stuffy for 2 people, but as long as you do not have to spend much time inside, it is not something to be worried about. In a nutshell, Nemo has managed an excellent balance of weight, comfort and durability. The one downside is it is relatively expensive. Even with one person, setting up the tent is extremely easy, thanks to the single hubbed pole. The NFL light Y-frame aluminum pole gets attached to the tent via a ball-and-socket system. The single end of the Y-frame slides into an eyelet sort of opening at the foot end of the tent, completing the Y-frame over which the canopy can be hung. The system is easy and surprisingly sturdy. As I mentioned before, the Hornet is a tight fit for 2 persons, although the 2 doors at the sides give some amount of relief. The floor space is 28 sq feet and the inner tent is tapered to be a little wider at the head and narrower at the feet. So, if you and your partner are sleeping in opposite directions – toe-to-head style – one of you will be getting slightly less space. This is why I suggest this tent as a better solo tent. At the center, the peak height of the tent is 40 in, with the floor dimensions being 85 x 51 in. This means that only one person will get to sit upright properly in the tent, and sleeping bags wider than 20 in might get uncomfortable. But such dimensions are needed to make the tent ultra lightweight. Even though the tent uses thin fabrics to keep the weight down, it is very sturdy against bad weather. At a glance, I thought the thin poles won’t hold, but they did. The rain fly does not provide complete coverage at the head-end, but the raised bathtub floor and high quality seams with waterproofing provide sufficient protection. A minor but pleasant surprise is the ventilation the Nemo Hornet provides. The raised section of the fly, coupled with lots of mesh and a big gap between the tent and fly, provided lots of ventilation and kept condensation to a minimum. This makes the Hornet a great backpacking tent, especially for humid environments. Our top pick for the best backpacking tent is the ALPS Mountaineering 5024617 Lynx 1-Person Tent which is meant for one person or 2 people if ever due to its simple and straightforward design that is really meant for backpacking and for light travel only. The material used for this backpacking tent is polyester taffeta with a lot of durability and resilience against bad weather. The poles that are used in this backpacking tent is made from 7000 series aluminum material for superior durability and quality beyond compare and the tent for backpacking has a design of 2 poles in its build and is also a free standing tent. It is an ideal tent for mountaineering and backpacking in general due to its simplistic design and easy set up. The rain fly of this backpacking tent is able to resist damage caused by UV rays and keeps itself as taut as possible in any weather and the polyester material of the rain fly is made from 75-denier 185T quality. The floor part of this backpacking tent is made with 185T 75D poly taffeta material plus a coating of 2000 mm for superior durability anti leak properties against the bad weather. The elements and the zippers are super large at #8 in their sizes so you can easily zip them when absolutely needed in violent weather. The pole clips that come integrated with this backpacking tent can help you set things up in no time and the tent spans at a size of 2 feet and 8 inches by 7 feet by 6 inches. Gear storage with this backpacking tent is not a problem due to the very fact that it has a vestibule in its build that also aids the user in weather protection. There are also buckles on the rain fly with a great weatherproof capability so you can adjust even when it is heavily raining outside and the whole tent area measures a total of 20 square feet so it is quite ample enough for 1 to 2 people with a light weight frame for backpacking purposes. At only 3 pounds and 15 ounces of weight, it is truly a backpacking tent due to its small size. The tent is also made with half mesh walls so it stays ventilated properly in the summer and also reduces the condensation during the cold days. There are mesh storage pockets for keeping your most important valuables and the aluminum stakes have a 7075 class quality for superior durability. The ALPS Lynx 1-Person Tent comes with all of the needed guy ropes for set up in a breeze without compromising stability. Also, a gear loft is ready to be used for your important items and the center height stands at 3 feet. When packed, it has a total size of 17 1/2 inches by 6 inches only so it is very convenient for backpacking as a 1 person tent or 2-person tent. The polyester material is made with 75D 185T quality. The depth of the vestibule spans at 32 inches and the poles of the tent have diameters of 8 1/2 mm each. The vestibule area spans at 10 square feet overall and if you want to go backpacking solo or with another person then this backpacking tent is your best bet. The rain fly has been factory sealed for superior protection against the rain and it has one widely opened door for easy entry and it has a dome form factor design. The zippers used in this backpacking tent are #8 in its size and it also comes with all of the sacks for the needed stuff for better organization. It is backed by a limited lifetime warranty. Our step-up pick is the Mountaintop Watreproof 3 Season 2-3-Person Tent and this high quality backpacking tent is also meant for camping due to its good size. It can accommodate as much as 2 to 3 people in its capacity for a backpacking tent and it also comes with a convenient carrying bag for use on the go while backpacking or traveling. It is also highly applicable for up to 3 seasons due to its versatility. The tent is made from high quality Oxford material in layers with a waterproof capability and a quality of 210-denier and its pole frame is made from high quality fiber glass material. The whole structure is available in various tent designs to choose from and the inner tent measures 71 inches by 79 inches overall with a room height of 48 inches. The floor is also made with 210-denier Oxford material for superior durability and it comes with a total of four wind ropes for superior stability plus 8 tent pegs for greatly holding against the high winds of any storm situation. It is also an applicable backpacking tent for going to the beach, going to the park, fishing, boating, road trips, hiking, camping and many others and it is also very breathable, resistant to moisture and resistant to tearing other than being waterproof. At only 5 pounds, it is very easy to carry around for a bigger tent. The rain fly is a multi-purpose item such that you can use it as a canopy, a fishing awning, a pavilion along with the groundsheet and many others and there are 2 doors in this awesome backpacking tent for easy access and easy entry between partners. The tent is also very easy to set up and to take down for saving a lot of time in the process. The zippers on this backpacking tent are two-way in their design so you can use them either from the outside or from the inside. The tent poles are made with durable fiberglass material for the tent’s stability and support and the rain fly is also highly resistant to the harmful UV rays of the sun other than being waterproof in its design. There is also a double sticker design using waterproof adhesives on the backpacking tent and there are also hooks that help the inner tent and the rain fly stay connected amidst any storm. The insert point of the tent makes it easy to lift up the rain fly when needed and there are also tent sleeves for protection against the strongest winds possible. The buckles used for the rain fly and the inner tent are very durable in their design and the mesh vents give a lot of ventilation in the process yet can easily protect you from mosquitoes and other insects in the air without compromising fresh air. The mesh vents also reduce the amount of condensation significantly in its design and the stakes are very easy to use and helps to keep the tent on the ground during tight situations. There is also a hook for lanterns and lighting for your tent and the mesh vents are also zipped for extra protection and ventilation. When packed, it measures a total size of 31 inches by 5 inches so it is quite compact in its design as a backpacking tent. Humidity is also balanced due to its mesh vent system. The inner layer is also coated with B3 mesh that is of high quality. The poles are also sprint loaded using air pressure for an instant tent that can be automatically pitched within 3 seconds. The Mountaintop 2-3-Person Tent is backed by a limited warranty of 90 days. Our budget pick is the EDBMG Instant Automatic Pop-Up Backpacking Tent and this backpacking tent has a pop-up design mechanism which makes it easy to set up within seconds with just one step in its build. The tent can be neatly packed into a small folded size of 4 by 35 inches so it is relatively easy to carry for hiking and camping as a backpacking tent and it can fit up to 2 people in its size as a backpacking tent. It is also an automatic instant tent so it is good for people who want to worry less about setting up camp anywhere and anytime. The base size of this 2 person tent for backpacking measures 48 inches by 78 inches and the zippers are also 2-way in their design to make it easy for any person to use the zippers from the inside or from the outside. It can be a solo tent and it can also be a 2 person tent and there is also a screen for preventing insects such as mosquitoes from going in. The window is also back screened in its design and the base has a bath tub design so it is free from leaking and such. It is only at 4 pounds so it is very easy to carry as a backpacking tent that is pop up in an instant in its design and it comes with all of the needed stakes plus the carrying bag. If you want a greatly water resistant backpacking tent then this one is for you. This backpacking tent, the Guide Gear 10×10′ Teepee Tent, is so unique because of the very fact that it has a teepee style design which mimics the designs of the Native American culture. The backpacking tent measures 10 feet by 10 feet so it has a lot of room for people to sleep and roam around and place their belongings to and the pole of the center part of the backpacking tent is made from high quality steel material for the best durability possible. The windows are covered with mesh material for better breathability and air circulation within the backpacking tent and the polyester material on the tent is made with a heavy duty construction yet light weight and is also waterproof in its quality. The tent is also made with 190D polyester material in its outer shell which is very waterproof in its design while the windows have also been weatherproofed and built to last with its rugged style. The polyurethane coating has a quality thickness of 1000 mm and the seams of this backpacking tent have been sealed in the factory for superior durability against the bad weather. It is only at 14 pounds yet it can house up to 6 people inside so it is great for backpacking in its design and weight and you can also prevent accidents at night using the guy ropes that are coated in silver and black and have a pull through design. The center height of this backpacking tent is 6 feet and 6 inches so it has a good head room height and the floor is made from high quality polyethylene with a sewn-in design. You can set it up even if you are just one person and it can also fit up to 2 cots inside of the backpacking tent. It has a spacious inside due to its great design. For those who need something waterproof then go for the STAR HOME Outdoor Waterproof Camping Tent because this tent has double layers of protective polyester material for superior comfort from the elements. It has the capacity of up to 2 people inside. At only 5 pounds, it is a great backpacking tent and a camping tent due to its light weight. The polyester fabric of the fly sheet is made from high quality rip stop fabric with a quality of PU 3002 to protect you from the harsh rain and heavy weather. The mesh is made from B3 nylon which is airy in its design and in its build and the inner part of the tent is made from Oxford polyester material with a quality of 210D in its build. The camping and backpacking tent measures 55 inches by 83 inches with a total height of 45 inches and when folded, it is only 8 by 19 inches so it is relatively small and portable. The tent can also fit an air mattress and is also very easy to put together and it can be easily pitched as a backpacking tent for any occasion whatsoever such as concerts or stargazing. The pole of this tent is made from high quality aluminum material and it only takes one person to easily assemble this backpacking tent conveniently. Ventilation is well maintained inside the backpacking tent due to its two ventilation windows. Wind ropes also help the backpacking tent to be wind proof in its design. If you want a fiberglass frame tent then go for the Mountain Trails South Bend 4-Person Tent as this backpacking tent can fit up to 4 people in its size and its build. The material used for this backpacking tent is high quality polyester and it has a sporty design and it has a form factor of a dome for a backpacking tent. The fiberglass material that is being used in the frame of this backpacking tent has been shock corded for easy set up along with the pin and ring system which makes setup a breeze. The total dimensions of the tent is 7 feet by 9 feet with a room height of 4.3 feet overall and it uses a duffel bag system that allows you to stow and go for added convenience in setting up and taking down. Ventilation is also improved due to its mesh roof vents which are very large and are very accommodating. The windows of this 4 person backpacking tent also aid in its ventilation capabilities and storage for your gear will not be a problem due to its integrated gear loft as well as utility pockets for valuables. The door has a D-style design and is quite large to avoid awkward entry and exit situations and the tent only weighs 7 pounds yet it can fit up to 4 people so it is truly a backpacking tent to consider for your next trip. Its fiberglass build helps it to be sturdy without snapping in the storm and without sacrificing the weight of the backpacking tent at all. The interior space has a total area of 63 square feet. The floor of this backpacking tent is made from high quality welded polyethylene that is anti leaking in its design and it also comes with a high quality rain fly for protection against the rain. Two people more or less can sleep in this awesome backpacking tent, the Semoo 2 Person D-Shape Door Tent. Protect yourself from the elements using the durable polyester build of this backpacking tent at PU 1000 mm and at 210D quality. The backpacking tent measures 55 inches by 78.7 inches and the backpacking tent has a D-shaped door so it is very easy to enter and exit the tent. You also get absolute protection against UV rays of the sun that can damage your skin and your tent and belongings because it has a polyester shell with a lot of UV resistant qualities. The whole tent can just take about 30 seconds of set up time so it is very convenient for the average backpacker and ventilation is very good because of its mesh vent as well as its convenient window systems. The tent has a center height of 43.3 inches overall so it is good in its head room measurement. You will definitely feel at ease when you travel and camp with this backpacking tent and you can also use it for up to 3 seasons in a year. At only 5.9 pounds, it is super convenient to carry for your next backpacking trip. There are a total of 8 metal pegs or steel stakes plus four guy ropes for handling the stability of your backpacking tent during a big storm. You can also easily keep the bugs out using the mesh vent so you stay safe during any season and there is also an included fly sheet or rain fly for protection against the elements. The Snugpak Ionosphere Olive Green 1-Person Tent has a PU coated rain fly with a low profile design and a waterproof index of 5000 mm and its rip stop is made from high quality 210T polyester material. It is also compact and small as a great backpacking tent. With a free repair kit, you can make repairs on the go. The inside of the tent is made with 190T plus a protection of polyester mesh and a no-see-um mesh for bugs that is made from 50D polyester material and it fits one person in its size. If you want to go star gazing at night then we suggest that you buy this awesome backpacking tent, the Topnaca 2-3-4 Person 3-Season Backpacking Tent, due to its double skylight feature. The tent can be used for up to 3 seasons due to its versatility in its ingenious design. The tent can be between 2 persons up to 4 persons depending on the size that you select and a buckle comes with the outer door curtain so you can roll it up when it is not needed for easy entry and exit and also for ventilation during the summer. The two skylights can also be opened and closed at your own will for added ventilation in the summer or for insulation during rainy days. You can also use the outer layer as storage for your items such as backpacks, shoes and the like and the window has a brace type design that is very sturdy and convenient. You can also open the door from the inside and from the outside so it is easy to operate. The airy mesh used in the tent’s build is made from B3 nylon and the cloth used is a 210T polyester material and the poles are made from high quality aluminum material that can withstand the test of time and bad weather. The fabrics of this backpacking tent are all waterproof and high quality and the waterproof index of the backpacking tent is more than 4000 mm. Tent nails and a sturdy skeleton make up the wind proof qualities of this backpacking tent. The tent comes with two frame poles and four fixed ropes and there is also a fly sheet or rain fly for convenience during the rain. The aluminum is of 7001 high quality and has a diameter of 0.335 in each of the pole and the waterproof index of the ground is at 5000 mm and it is made from Oxford cloth with a quality of 150D which makes it tear resistant. A sturdy PU coating also wraps the fly sheet of this backpacking tent. Now that you have a tent, it is super important to know how to ensure it stays usable for years. Just like your home, even your tent will require a basic amount of cleaning. A well-treated tent will give you back more than what you had paid for it, not to mention the tension-free comfort you will have when waiting out rough weather. This is the one rule you must follow. Never store a backpacking tent which has not fully dried. Fabric coatings will degrade faster if it is left wet. What’s even worse is that a damp surface will attract mold and fungi, which will lead to even faster breaking up of tent fabric and terrible smell. It is always recommended that you dry your tent before packing it up in your sack, and dry it again once you reach home. Also, I would advise that you take the time to properly fold up your tent for packing, and not simply stuff it in randomly. A nice loose bag – something like a pillowcase – will be best for long-term storage of your tent. You should always try to avoid setting up in places with lots of rocks and stones and sticks, as the chances of puncturing the tent are high. Although you should clear up your campsite a bit before setting up, do not disturb the whole place. Always respect the natural surroundings. A good place to set up your backpacking tent will be on a flat patch of dry grass, gravel or snow, somewhere away from an established trail. One of the most important things is to avoid camping near water bodies, because you may be disturbing the wildlife present, and may also increase the risk of contamination of water. For protecting your tent and yourself, do not just think about the site, but also the surroundings. Camping at the bottom of a valley will mean that the air will be colder, condensation will increase and there will be a risk of sudden flooding or snow. You should also make sure you are not near animal habitats and away from places where there is a chance of landslides or avalanches. You should avoid leaving out your tent exposed to direct sunlight for long periods. I have come close to losing a tent myself, because I camped in a place without shade. Extended exposure to sunlight damages the tent fabric and the fly. Using a polyester fly might be better, as polyester is more UV resistant than nylon fabric. Forget storms, one of the most annoying things ever is a jammed zipper. Everyone feels like just tearing out the whole thing. But try and remain calm in face of an irritating zipper. If the zipper is stuck, pull and straighten the other end with one hand and pull the slider back a bit with the other. Now if you slowly try to move the slider ahead, you will find that it almost always works. Also, make sure there is no fabric or dirt stuck inside as that may block the slider. If the zipper keeps getting split, you can use a plier to slightly tighten the slider and make sure it holds. I know this will sound something like your mom would say. But I need to say it. Leave your shoes and dirty bags outside. You want to avoid everything that might introduce dirt, stones and mud inside your new backpacking tent and increase the chances of a puncture, or worse, dirty smell. Camping in the wild means you will be close to nature, but you should not invite the wildlife into your tent by leaving food and fragrant products outside your bag. Always keep food articles and personal belongings in a secure container like the Imper dry bag. Before you begin packing up your tent, you should make sure there is no snow or pebbles or twigs lying on the tent or the fly. Give your tent a good shake so that anything that might poke your tent fabric is dusted off before rolling it up. Whenever you are breaking down your backpacking tent poles, make sure you start from the middle. Keep doing this for every half section. This will ensure that there is no excess tension on the cord. Just a reminder again, do not forget to dry your tent before packing it. If at all you cannot dry the tent before packing it, make sure you store it in a separate bag and dry it as soon as you get back home. I know it is boring. But it has to be done. Cleaning your tent as soon as you get back from a trip will mean more comfort for your next one. You should not machine-wash your backpacking tent, as that may damage the fabric and seams of the tent. Instead, take a bucket of cold water, a soft brush and some non-detergent soap for your cleaning. Smooth out the tent and gently scrub away. You should avoid any harsh chemicals like laundry detergent and bleach, as it might damage the water-repellent coating of the fabric. If you notice any weird mud-like smell or discoloration on the tent, chances are that mold and mildew have started growing on the fabric. For dealing with this, you can use an enzyme cleaner or sanitizer will do just fine. Just make sure you rinse everything off after cleaning and let the tentto kill the growth. Check whether the cleaner is suitable for the fabric of your tent or not and follow only the instructions given. For other small annoyances like bird droppings or tree sap, a basic cleaning with wet wipes or sanitizer will do just fine. Just make sure you rinse everything off after cleaning and let the tent dry. Almost all good quality backpacking tents come with already-sealed seams, but even these seams might come off with normal wear and tear. For sealing the parts where the seams have come off, you can use a seam-sealer on the outside of the fabric for re-sealing. You should also check the fly and the floor of the tent regularly from the inside. If it starts to peel, you can remove the flakes with gentle cleaning, then apply some paint-on polyurethane sealant. Plan ahead and prepare. Visit in small groups and avoid times of high use. Also, make sure you have maps and a compass so that need for rock markings or flags is eliminated. Camp on durable grounds like rock, gravel, snow or dry grass. Do not alter the site in order to “create” a campsite and keep your campsite small and away from water bodies. Dispose of waste properly. Use only mild biodegradable soaps in small amounts, away from lakes and streams for washing. Deposit solid human waste in catholes away from the trail, water and campsites. Leave what you find. Do not disturb habitats and historical sites and build any structure or dig any trenches. Keep fires small and use only established fire rings, fire pans or mound fires. Always scatter cool ashes and try using lightweight stoves for cooking. Respect the wildlife and the habitats of the animals. Do not feed them, as it alters their behavior and might endanger their health. Observe the wildlife only from a distance and avoid them altogether during sensitive times like hibernation or mating seasons. Be considerate of other visitors and avoid loud sounds. Camp away from trails and always help out others. With a tent, you can explore freely and enjoy a full night’s sleep after a long tiring hike. But because of so many factors to consider, it is difficult to choose one backpacking tent that will fulfill all your needs. However, the main factors that weigh in more than others when choosing the best tent are price, weight, space, fabric used and the type of tent itself (freestanding or non-freestanding). A general rule you should keep in mind is that a tent designed for sheltering 1 person should be around 1 kilogram, while a 2-person tent should be around 1.5 kg. Usually, the height of whatever tent you choose should be around 35 inches, while the length should be at least 70 inches or more. Regarding fabrics, I would recommend SilNylon, unless you have the budget for Dyneema, which I have found to be the best fabric for tents. A PU-coated fabric will work only if you camp infrequently and only in pleasant weather. My recommendation for people with a relatively higher budget will be the MSR Hubba Hubba, a great all-rounder tent for rough use and the best considering value for money. 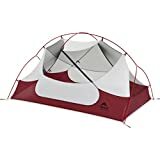 If you are looking for something cheap but also with decent value, you can consider the Rei Co-op Passage 2, which is roomy but quite heavy, and not designed for continuous use. For those of you looking for the very best lightweight tent which is easy to set up and quite durable, look no further than the Nemo Hornet. The tent is a little uncomfortable for 2 people staying inside for long durations, but it won’t be a problem if it is used for sleeping only. The real work will start after you have chosen and bought your tent, because you have to take care of it to get the most value and comfort. A few tips to keep in mind are to store your tent only when dry and always making sure that you set up in a place where there is nothing that might puncture the fabric. Also, you should always clean your tent and be on the lookout for any gaps in the seams. Even more importantly, follow the Leave No Trace principles so that you can camp safely without damaging the environment. After blabbering on for so long, one more thing I would like to say is that no matter which tent you choose, remember that the fun of camping is not in the tent, but in the surroundings lying outside of it. Happy camping !